It is not an exaggeration to say that the future of our country hangs in the balance right now. Conflicts in the Middle East and Central Europe threaten to draw us in, our economy is at best stagnant and an invasion of illegal aliens on our southern border threatens not only the character of our country and culture, but our very national sovereignty. In the midst of all these crises the easy thing to do would be to say “there’s nothing one guy like me can do about it” and head to the golf course or the beach. But there is something one guy like you can do about it. These crises didn’t happen overnight, and they didn’t happen because some external force imposed them upon us – they happened because over time our leaders failed to prevent them from growing into the existential threats they now represent. And much as we would like to blame them all solely on President Barack Obama and his failures and lawlessness, the fact of the matter is all too many establishment Republicans in Congress have been complicit in the creation of these crises. 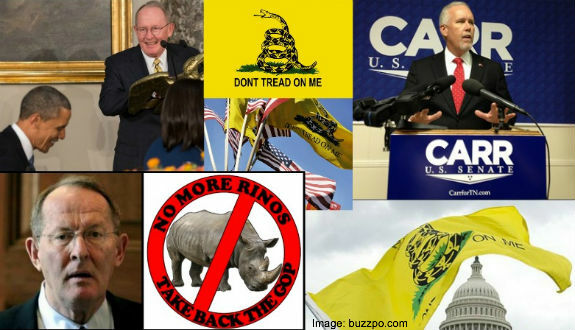 And one Senator, Lamar Alexander of Tennessee, who has voted with President Obama more than just about any other Republican, faces a primary challenge from principled limited government constitutional conservative Joe Carr on Thursday. Are you satisfied with the way the present Congress is raising our taxes, spending our money, and reducing our liberties? The Constitution makes Congress the most powerful branch of government. It can pass laws, impose taxes, and spend our money. To change things, you have to change the law. To change the laws, you have to change the people who make them. That means defeating Lamar Alexander in the Tennessee Republican Senate Primary and making principled limited government constitutional conservative Joe Carr the GOP’s Tennessee Senate nominee. Joe Carr has relentlessly attacked incumbent establishment Republican Senator Alexander for his vote in favor of amnesty, regularly pointing out the devastating effect amnesty will have on Tennessee’s hard pressed working families. Carr has nailed the crisis that incumbent Republican Senator Lamar Alexander has helped create – and it is not the “humanitarian crisis” lamented by Obama and his supporters like Senator Alexander – it is a crisis for American workers and their children who will be entering the job market in competition with the invaders. And Carr is also with conservatives on other important issues, such as spending, the deficit and the debt. We hope our friends in Tennessee have finally figured out that Lamar Alexander is representing big business, not the American workers of Tennessee. If you live in Tennessee and want to secure the border now, we urge you to vote for Joe Carr in Tennessee’s upcoming Republican primary. Yes, you can help, and here’s how. Email anyone you know in Tennessee and tell them how important it is to the future of this country to defeat Lamar Alexander and nominate Joe Carr. Call talk radio and urge everyone to do the same, use social media, such as Twitter and Facebook, to get the message out that if you want to stop the invasion of our southern border and defeat amnesty for illegal aliens then Republican voters in Tennessee must defeat Lamar Alexander and nominate Joe Carr.